I heard about this new variety of Fothergilla coming down the pipeline several years ago—my ears always perk up when I hear the phrase, “blue-leaved”—and in 2007, it’s here. A blue-leaved form of F. ‘ Mount Airy,’ Blue Shadow exhibits the same robust growth but in a slightly smaller frame. In Zone 4, plants will grow to around four feet high by four feet wide. 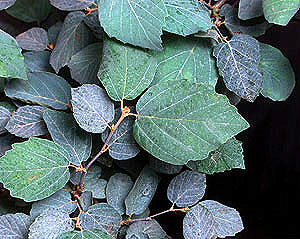 Unlike the attractive, glossy green leaves of Mount Airy, this new variety features powdery blue leaves that are a bit more rounded. The large, white, bottlebrush flowers that appear in spring are honey scented and similar to the superb flowers formed by Mount Airy. 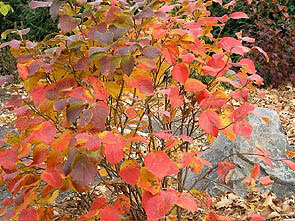 In the fall, you get what Fothergilla is famous for—sizzling foliage color ranging from yellow to orange to red.